This butterfly was observed in mixed shrub and savanna habitat near Machakos, Kenya, 30 May 2017. 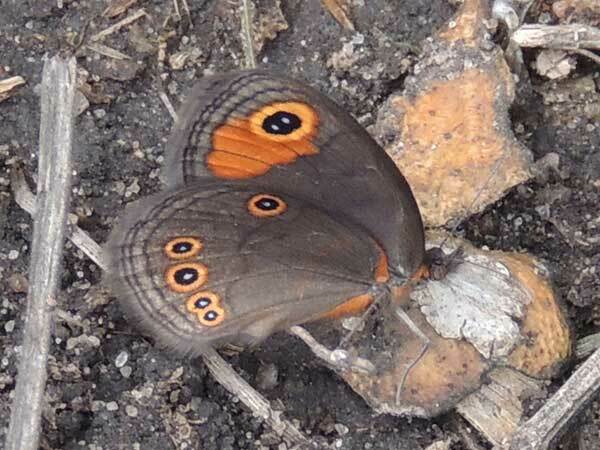 Most wood nymph butterflies, also called satyrs, are primarily brown in color. Many species have eyespots and most are denizens of wooded areas with plenty of shade. They rarely venture into sunshine and virtually never visit flowers. Instead they flit close to ground moving from shadow to shadow. Many satyr butterflies feed on various grass species in the larval stage. Copyright Michael J. Plagens. Page created 04 Oct. 2017.